That is how I ended up at Beauty and Charm. It’s a class for middle level science teachers about how to teach particle physics. It was held at Fermilab – Fermi National Accelerator Laboratory in Batavia, Illinois. Until Monday, my concept of sub-atomic particles was limited to the proton, neutron, and electron. Physicists have been very busy since I took chemistry and physics in the 1970s and 1980s. They’ve added quarks, muons, and neutrinos and I needed a refresher. After a week on the Fermilab campus, full of lecture, campus tours to see high-energy physics experiments at work, as well as hands-on leaning activities I know still have a lot to learn but I feel much more competent. That’s where I discovered the bubble chamber above, Monday morning. 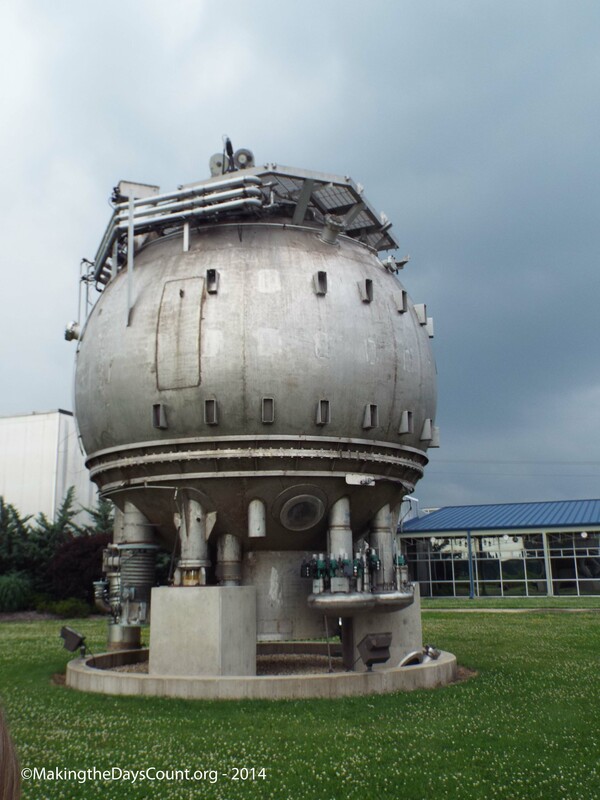 The bubble chamber was filled with 8,000 gallons of liquid helium and used to help physicists see the particles after bubble trails left by sub-atomic particles after they had been accelerated close to the speed of light and smashed into smithereens. The resulting subatomic particles left trails in the liquid helium and led to the discovery of the bottom quark in 1977 and the discovery of the top quark in 1995. Quarks are the building blocks of protons and neutrons. I have purposely over-simplified the concepts because after a week of quarks, leptons, neutrinos, muons, and atomic forces – I am on overload. Fortunately, I have a few weeks for all of this new knowledge to sink in. I am glad I took the class, one of my new eighth grade teammates took the class with me and we’d share a look and talk when we had time to discuss over lunch or on breaks. I am excited and I think the students will enjoy particle physics much more because of the content and activities I learned this week. I am grateful for Fermilab because of the resources they have available for me (and everyone) to use – below is a Fermilab physicist explaining the standard model. Today is the 39th day of summer vacation and it’s late – almost 10 PM – tomorrow is a new day I have thirty-two days left of summer break – thirty-two days to learn more about science and to prepare for a new year of learning. Thirty-two days to spend on summer fun and summer promises. Today WAS a GREAT day and tomorrow promises to be a million and six times better. Making the days Count, one day at a time, and one learning experience at a time. What do you remember from middle school science? Today’s post is in response to the Daily Post’s Weekly Photo Challenge – prompt – at Word Press. The week’s prompt is “Containers.” This week, share your own vision of a container you find interesting. You can take the challenge as literally as you want — a box of chocolates, a broken bottle, your town’s water tank, an empty shell on the beach. Or go in a more figurative direction — from the skin that wraps our body to the comfort of a hug, we all constantly hold and are held by other things and other people. That’s an awesome container. Apropos: helium balloons should have been banned: it’s such a waste of helium. I’ve managed to finish a few projects at home like fixing the bathroom window, buy and install some furnitures and pickle some vegetables, but there’s still a lot to be done: I have a door to fix, photos to arrange/print (this could take several weeks of work). I’ll definitely be needing that summer keeping container to get it all done! I admire your enthusiasm, Clay. You always charge towards your goals. I had to check our your Beauty and Charm link – it sounds like fun! I’d love to be able to sit in one of your classes next year. I think you’re going to be great! thank you – I am sure there will some classes that are complete duds – there always are and I am certain there will be a few where the ‘sparks fly’ and quite possibly that could be a literal and actual occurrence, but I hope to contain the sparks to the minds of the young ‘uns. Take care and enjoy your week. I’m in awe of the fact that as a non-science specialist you are not only having to teach the subject, but appear to be relishing the challenge. My own science education was not a success. Perhaps because I was taught by specialists who’d always loved and understood it. There may be a lot in being taught by someone who’s recently had to master the difficulties themselves. Good luck! Thank you. With the way teacher certification works(at least where I live and work), I needed a minimum of 18 semester hours to qualify for an endorsement in an content area. because I meandered through my early college career, I have endorsements in several areas – social studies, English Language Arts, and science. I have a bachelors degree in history (earned 1985) in addition to my bachelors in education (earned 1999) and I recall completing the paperwork for endorsements and realizing I was a hour short in mathematics and French, mon dieu! I remember several of my teachers from the time period 6th to 8th grade (11 to 14 years old) and am a Facebook friend with one of them – she had a profound impact on me and I am grateful for her influence. I believe that it is not how much you know that matters, but how much you care that’s important at that age. Friday my class sat down with a doctor in physics and he patiently answered all of our questions about particle physics for over an hour – all of our questions. It was apparent he was far smarter than I am, but I never felt it. I am looking forward to the challenge, the kids are the best and that’s what I am really looking forward to this coming year.